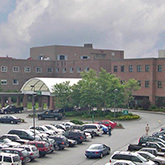 The nine station University of Vermont Medical Center Renal Dialysis Unit offers the type of Renal Dialysis called Hemodialysis. Healthy kidneys clean your blood by removing excess fluid, minerals, and wastes. They also make hormones that keep your bones strong and your blood healthy. When your kidneys fail, harmful wastes build up in your body, and you may retain excess fluid and not make enough red blood cells. When this happens, you need renal dialysis to replace the work of your failed kidneys. At CVMC we offer the type of Renal Dialysis called Hemodialysis for the convenience of local residents whose doctors have ordered them to receive dialysis. Hemodialysis uses a machine to take over much of the work of the failing kidneys. This type of dialysis uses an artificial kidney to filter waste products, regulate chemicals, and remove excess fluids. Since the artificial kidney performs the life-sustaining work of your kidneys only three times weekly, it is not as efficient as your own healthy kidneys. The important thing to remember is that dialysis will make you feel better by preventing the buildup of toxins that can make you ill.
We have nine stations in our Renal Dialysis Unit. There is one nurse and three technicians for every nine patients. We run dialysis for patients during the hours of 5:30 am - 9:30 pm, Monday thru Saturday. Each dialysis appointment takes approximately 3-4 hours and three sessions per week are required for each patient. It is important that you keep your scheduled appointment time. If you need a schedule change, please alert your nurse as soon as possible and she will facilitate that. You are responsible for your overall fluid intake and will receive a monthly report to let you know how well you are doing. We use a multi-disciplinary approach to help round out your care. We have a dietitian, social worker, physician's assistant and registered nurses on staff and available to help you with the lifestyle changes necessary to be successful while you are on dialysis. There are other options to hemodialysis for patients with renal disease. These include: home-based peritoneal dialysis or organ transplant. See contact information below. Please be at the unit 15 minutes before your scheduled appointment time. Your family members should not be in the unit while you or another patient are being put on or off a machine, but can be at your side thereafter. No one under 18 should be with you during dialysis unless they are accompanied by another adult. Visitors are not allowed to eat in the unit. The Renal Dialysis units is staffed by one nurse and three technicians for every nine patients.